Chrissy Kuras has always had a passion for helping animals. Even as a kid, she was always taking care of injured wildlife and bringing stray dogs and cats home. That passion of animals led her to working at Veterinary Hospitals for 30 years. During that time, while also living in Arizona, she started volunteering and fostering for animal rescue organizations. Almost six years ago, Kuras and her family moved from Arizona to Ohio. She continues her passion for animals here in Columbus by being a volunteer and foster for A Purrfect Start Rescue. Than, last July, an idea struck Kuras. And her passion project of opening a cat cafe in Columbus started. “I actually read an article on Facebook about cat cafes making their way to the United States,” Kuras begins. “Immediately, I did some research in hopes of finding a cat cafe nearby that I could visit. The closest cat cafe at that time was in the D.C. area,” she adds. And that’s when opening the cat cafe – Eat, Purr, Love Cat Cafe – became Kuras’s mission. Eat, Purr, Love Cat Cafe will be a place where a clowder of cats can have a comfortable, cage-free, home-away-from home environment until they eventually find their forever homes. For all of us humans, it will be a place for relaxing and enjoying cats with other cat aficionados. 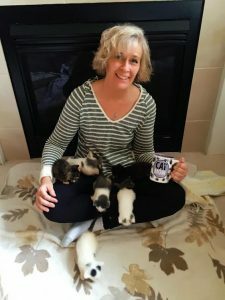 “What I think will make it unique are my plans to utilize the cat cafe for helping various cat rescue organizations and bringing awareness to their mission of helping homeless cats,” Kuras explains. It’s something that’s very near-and-dear to her heart, because she knows firsthand what happens when there are more cats than there are homes. “I’m hoping a cat cafe will not only be a fun place to commiserate with cool cats, but another way to get people involved and bring awareness to the importance of advocating for them as well,” she says. Kuras also talks about the excitement she’s received since deciding to open Eat, Purr, Love Cat Cafe. “Hands down, the best part about this venture is all of the wonderful people who have contacted me about their shared excitement to have a cat cafe in Columbus, along with all of the people I have met and the new friends I have made,” she says. 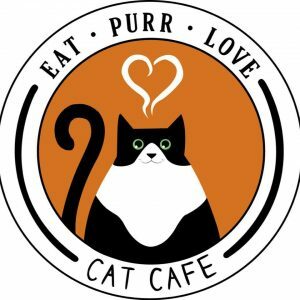 Eat, Purr, Love Cat Cafe is working with a local shelter, which is where they’ll be “fostering” their cats from. They also planning on hosting several cat rescue/spay-neuter organizations for fundraisers, workshops, and volunteer orientations. There will also be special events such as painting and yoga, or “Yogatos,” taught by Kitty of Nyanko Yoga. They’re also organizing events for kids such as movie night with cats and reading to cats. They’re still working on securing a location, and will make a formal announcement when everything is set. Kuras and the cat cafe are also looking at collaborating with a local coffee roaster. They also hope to end up close to a local bakery or maybe even team-up with a food truck at times, if possible. Stay up-to-date with all Eat, Purr, Love Cat Cafe’s news, and their upcoming crowdfunding campaign, by visiting their website at www.eatpurrlovecatcafe.com. And be sure to follow them on Facebook, Twitter, and Instagram. You can also catch up with them at their booth at The Fetch a Friend Event May 14 and 15.